Mocha VR was instrumental in the post-production of the pilot episode of our new series “Historic Treasures of the National Parks: Scotty’s Castle.” Scotty’s Castle is a popular historic landmark at Death Valley National Park that was damaged during a flash flood in 2015 and will be closed for repairs through 2020. 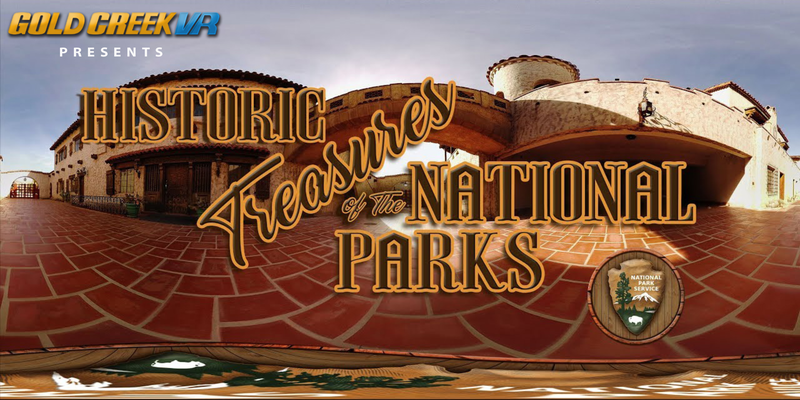 Death Valley National Park reached out Gold Creek VR to create a Virtual Tour of Scotty’s Castle, showcasing the rich history and beauty of the castle, while raising awareness of the damage that occurred. The production had several unique challenges as Scotty’s Castle had no electricity at the time of filming, which meant that any supplemental lighting had to be battery powered. One particularly challenging room to capture was The Music Room. Our crew was accompanied by Death Valley National Park Rangers who ensured that certain items and areas remained untouched, as the room is incredibly well-preserved. Even with limited space to setup, we wanted to incorporate some camera movement into the scene, so we utilized our motion control movement system to do a move along a narrow pathway leading toward a spiral staircase. One element that complicated the shot was that during the camera move, certain objects came much closer than five feet from our Freedom 360, which is a 6 GOPRO camera rig. This meant that at certain parts in the shot we would encounter some parallax issues with image ghosting as the camera moved. Even though we understood this would be an issue on set, we figured might as well capture the shot and hopefully later we could “fix it in post.” With the help of Mocha VR, that’s exactly what we did. During the post-production process we investigated various stitching methods and software on our moving shot including APV as well as Mistika. Each pass we did had certain desirable elements, however because of the way we captured the shot, no individual pass was perfect. 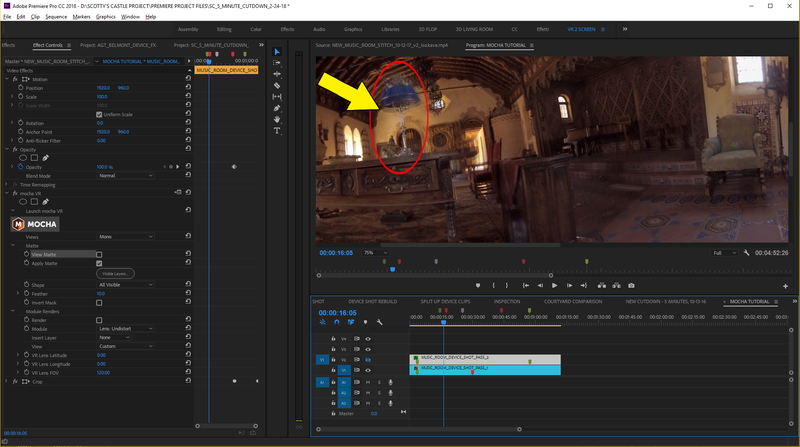 Enter the Mocha VR multi-layer method in Adobe Premiere Pro. We were able to utilize the best parts of the same take exported using two different stitching methods. This meant isolating desirable elements from our second pass and then compositing those elements on top of our overall best pass, in the offensive areas. THIS WORKED GREAT! You can even click on “view matte” and black out everything but the matte for fine tuning. In the portion of the take that we used in the final show, there is a lamp on a table and as the camera moves by it ends up positioned right between the stitch lines at a certain point, causing the lamp to look completely distorted in our first pass. The stitching method used in our second pass showed the entire lamp in plain view, completely undistorted. However other areas of the room had stitching issues. We simply rotoscoped the lamp from the second pass, tracked the shot with Mocha VR and then applied the matte on top of our first pass layer. Just like that we had our clean, undistorted lamp! After a bit of edge feathering and a stabilization pass utilizing the reorient module, we were off to the races! Performing camera movement in 360/VR can be challenging, but it’s always worth the effort. Having Mocha VR as part of our tool set allows us to be even more adventurous with adding cinematic camera moves to our 360/VR series. We employed this same Mocha VR multi-layer technique on an upcoming episode of “American Ghost Towns” where our host Ted Faye and a resident historian travel through the town of Belmont, Nevada on their way to the Belmont Courthouse State Historic Park on an ATV. We mounted the camera using a Super Clamp and monopod, extending the camera out to get a full shot of the vehicle. Once again, because of our camera positioning, there wasn’t a perfect stitching method. The first pass had the best overall stitching for the environment, but rendered our talent’s faces distorted. The stitching method used in the second pass was best for their faces, however it created hard stitch lines in the sky. Mocha VR allowed us to take the clean undistorted faces from our second pass and seamlessly composite them over our first pass creating the illusion of a PERFECTLY STITCHED TAKE. We’re currently in production on “Super Pups,” our 8K 3D 360/VR Superhero Shih Tzu action comedy series, which is full of camera movement! We’re excited to utilize the spectacular new stereo features in Mocha VR and to implement the techniques we learned creating our VR documentary work into a fun and exciting narrative VR series for the whole family!